My fiancé and I have four sons, Kevin (15), Kyle (14), Tyler (13), and Austin (almost 12). We all went to Orlando a few weeks ago in January. We were fortunate to get to spend time in both Walt Disney World’s Animal Kingdom and Epcot and Universal Studios. I’m a life-long Disney fan, but I was surprised at how much I enjoyed Universal Studios. I was curious what our teens thought about the parks. Some of their perspectives surprised me! Here’s what they loved—and what they didn’t love. I liked the line for the Fast and Furious ride because it had a bunch of car parts, gun stuff to look at, and famous cards along the way. There was lot of eye candy to look at while you were waiting.— Kevin. The wait was long for Flight of Passage.— Kyle. I thought there were to many Disney-owned stores at Disney Springs. It felt like all of the stores were the same. I would like to see more nonDisney stores. —Kevin. About the Author: Jennifer Bright Reich is cofounder and CEO of Momosa Publishing, a family- and veteran-owned hybrid publisher in Bethlehem, PA. MomosaPublishing.com. 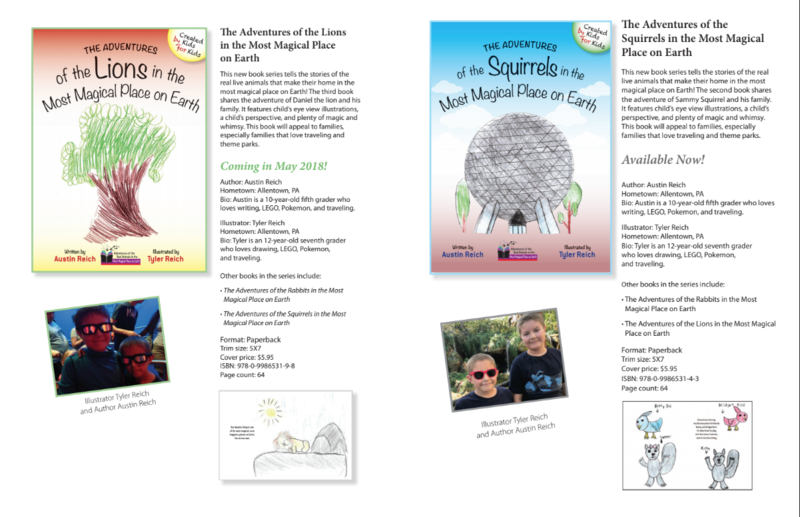 She publishes health, parenting, inspiration, and children’s books, including books for kids by kids, like The Adventures of the Rabbits in the Most Magical Place on Earth, The Adventures of the Squirrels in the Most Magical Place on Earth, and The Adventures of the Lions in the Most Magical Place on Earth—stories about the real animals that live in Walt Disney World, which are all written by her son Austin Reich and illustrated by her son Tyler Reich. It was truly a joy to watch my favorite silly ole bear come to life on the big screen interacting with real people in today’s world! The movie begins around the time that the original story is about to end. You’ll see a few of your favorite moments with Christopher Robin as a real child playing with his Hundred Acre Wood pals before he goes off to school. Sometimes life has a way of making children grow up quickly. Christopher has a lot of difficult things to deal with during the chapters of his life from the time the story that we all know and love ended until we get to the point where this story begins. But there comes a time in everyone’s life when we can get so engrossed in the urgency and responsibilities of adulthood that we can lose that part of us that made time to simply do nothing and enjoy the moment. It’s in those precious moments when we allow ourselves to relax in the thing that we love most about life, that refresh us and allows us to be a better person for every aspect of our lives. This movie had a few difficult real-life moments and if you’re prone to crying at movies, you may want to bring a tissue…but every bit was kid-friendly. In the end, it helps you think about prioritizing the things in life that truly matter and see things the way we always really have from deep down within ourselves. That person that we were long ago is always inside us. Ewan McGregor does a nice job of bringing Christopher Robin to life as an adult and Jim Cummings is a spot-on voice of Pooh and Tigger. Also, make sure you stay through the credits for some extra-special appearances. The Sherman Brothers, made up of Richard & Robert Sherman, were the duo that Walt Disney called on to create some of the most memorable songs in the world. Robert passed away in 2012 but Richard Sherman, who just celebrated his 90th birthday, makes a special appearance and wrote some new music for Christopher Robin with the same catchy lyrics and tunes that “The Boys” were known for back when Walt still worked in the studio. Please note that I was invited to a complimentary viewing of this moving on Tuesday, July 31, 2018 so that I could bring you this review on behalf of Krista Joy of Disneyways.com. The free admission in no way influenced my love for this movie. All opinions are my own. ABOUT THE AUTHOR: Beatrice Denis moved to Florida in 2010 from North Carolina, due to her love for all things Disney. She recently had a Disney Fairy Tale Wedding on Land and Sea at both Walt Disney World and on the Disney Wonder on Alaska water with beautiful snow-capped mountains in the background. You can follow her upcoming adventures on her blog, A Disney Girl in Orlando. It is Sunday July 23rd at 4pm eastern Walt Disney World Time WELCOME to Disneyways dot com on facebook live! We are bringing you Disney dreams, hints, secrets and more from the heart of the magic! I am your host and founder of Disneyways.com – born raised and still living in Orlando Florida, Krista Joy, and tonight we have info on a FREE Disney vacation being given away by Big Ears Adventures.com, Disney Happenings with JR – and a VERY special in PERSON INTERVIEW with author and former cast member DEAN GASCHLER, who was grand marshal coordinator at Walt Disney World’s Magic Kingdom for over 14 years! WIN a Disney Prize Pack and a Disney Fan DVD! Disney news, tips, and secrets from Orlando native, Krista Joy of Disneyways.com! Follow BigEarsAdventures.com @BigEarsAdventures on Facebook @BigEarsAdventur on Twitter @BigEarsAdventures on Instagram. Also sponsored in part by Peter Alden’s Kingdom Classics! Classic Disney songs, with a retro rock vibe!! Peter Alden captures the ‘classic’ feel of the golden age of rock and fuses it into some of your favorite Disney classics!! Download your copy at https://store.cdbaby.com/cd/peteralden and help support us here at Disneyways on Facebook live!! World Secrets ~ A Taste of Filet Mignon at Disney World for just $11! Who knew you could get Filet Mignon at these prices – on DISNEY property?! Worth every penny! If you are aware of this being offered any place else other than Top of The World Lounge, be sure to leave me a comment! Check out the video for a full tour of the lounge, and more. Splurge and get the cheese board too. It’s lovely! And, for the first time ever at D23 Expo, fans will get to enjoy a daily street party, featuring celebrities, Disney characters, and live music on the show floor. BURBANK, Calif. (June 13, 2017) – The excitement is ramping up from “zero to hero” for D23 Expo: The Ultimate Disney Fan Event. During the three-day spectacular, which takes place July 14–16 at the Anaheim Convention Center, guests will have the chance to celebrate the 20th anniversary of Hercules with members of the cast and creative team; hear from Disney Legends, including 2017 inductee Mark Hamill, during a panel hosted by Leonard Maltin; and enjoy the music of Walt Disney’s classic live-action musicals in a remarkable stage production featuring Lesley Ann Warren and hosted by Whoopi Goldberg. John Stamos will host a chat with Legends of Walt Disney Imagineering. Plus, theWalt Disney Archives will host three days of presentations on its own stage. And, for the first time, guests will be able to enjoy a daily “Ultimate Fan Street Party” right on the show floor. Mousequerade, the fan-favorite costume competition that invitesparticipants to create their own Disney-inspired designs, returns to D23 Expo 2017. Join judges Ashley Eckstein (Star Wars Rebels), Kara Saun (costume designer for Descendants 2), Yvette Nicole Brown (ABC’s The Mayor), and the contest’s host, Disney’s Jim Babcock, to watch dozens of finalistscompete in five excitingcategories for the $2,300 grand prize! In the 25 years since the final episode of The Golden Girls aired in 1992, the television series has become an enduring fan favorite that continuesto be watched throughout the world. Celebrate with us as we bring together the show’s creators and other special guests for this unforgettable event. Join film historian Leonard Maltin as he celebrates the 30th anniversary of the Disney Legends program with a remarkable lineup of individuals who have each left an indelible mark on the Disney legacy, including Bill Farmer (the voice of Goofy and Pluto), Imagineering Legend Bob Gurr, Walt Disney Archives founder Dave Smith, and 2017 inductee Mark Hamill. In the 1960s, Walt Disney sought to expand his filmmaking style beyond animation and bring music to a variety of new live-action film projects. D23 Expo will celebrate these magical, musical movies in a live stage extravaganza—hosted by Whoopi Goldberg and featuring Lesley Ann Warren, Karen Dotrice, and other renowned guest stars, joined by live musical performers and a 20-voice chorus—to showcase Summer Magic, Mary Poppins, The Happiest Millionaire, and The One and Only, Genuine, Original Family Band, as well as others. From the heights of Mount Olympus to the depths of the Underworld, celebrate the 20th anniversary of the Disney classic that put the “glad” in gladiator! Join a group of legendary artists and filmmakers who brought Hercules to life, including directors John Musker and Ron Clements, animators Eric Goldberg (“Phil”) and Ken Duncan (“Megara”), as well as Megara and Hercules themselves—Susan Egan and Tate Donovan—as they recount stories of making one of the most epic animated features of all time. For eight decades, Disney fans have whistled “Heigh Ho” while they worked. Now, in honor of the 80th anniversary of Walt Disney’s first-ever animated feature, D23 Expo is proud to presenta special screening of the film that startedit all: Snow White and the Seven Dwarfs. Join a fascinating conversation, hosted by John Stamos, with three Imagineering Legends—Marty Sklar, Tony Baxter, and 2017 Disney Legend inductee Wayne Jackson—as they recount true-life anecdotes and share personalstories about the celebrated artists, designers, and technical wizards who established the foundation and guidingprinciples for groundbreaking Disney experiences around the globe. The popular Walt Disney Archives Stage returns, more than doubling its capacity, as it hosts 17 panels and presentations throughout the weekend. Disney notables, such as director Pete Docter, Disney Legend Jim Cora, producer Don Hahn, Bret Iwan (the voice of Mickey Mouse), Imagineers Diana Brost, Jason Grandt, and Chris Merritt, plus many more, will participate in panels throughout the weekend. Fans will enjoy exploring many of Disney’s worlds, from the incredible work of Marc Davis and the original characters of the Disney Parks (such as Figment and the Country Bears) to the women of Disney animation and an incredible virtual walk-through of the Walt Disney Studios on Hyperon Avenue. Visit D23expo.com for the complete schedule. Located in the center of the D23 Expo show floor, Center Stage will be the heartbeat of the Expo and a hub of activitythroughout the weekend. AimeeCarrero, the voice of Disney’s Elena of Avalor, will perform live for the first time, and will be joined by special guests including Lou DiamondPhillips who voices series’ villain, Victor Delgado. Also performing on Center Stage will be TemeculaRoad, Tomasina, Billy Hill and the Hillbillies, nerd-rock group Kirby Krackle, and Susan Egan, who will sing favorites from Beautyand the Beast. Disney animators, including Eric Goldberg and Mark Henn, will show aspiringartists “how to draw” throughout the weekend. Marvel’s Brian Crosby will show fans how to draw Spider-Man and Groot. And BillRogers, the “voice of Disneyland,” will be on-hand each day to record fans’ outgoing voicemail messages in his signature dulcet tones. The comletelineup will be availablein the coming weeks on the D23 Expo app. For the first time at D23 Expo, guests can enjoy a one-of-a-kind street party—right on the D23 Expo show floor. Twice each day the cavalcade will travel down Mickey Avenue, with a live band, beloved Disney characters, high-energy dancers, and celebrity grand marshals! Stan Lee and Mark Hamill will grand marshal the first cavalcade on Friday, July 14, and members of the cast of Descendants 2 will lead the second that day. Additional talent and times to be announced in the coming weeks and will be available on the D23 Expo app. Talent subject to change. Additional details are available at D23expo.com. Ticketsfor D23 Expo 2017 are available for $81 for one-day adult admission and $59 for children 3–9. Members of D23: The Official Disney Fan Club can purchase tickets for $72 for a one-day adult admission and $53 for children 3–9. Multi-day tickets are also available. For more information on tickets and D23 Expo 2017, visit D23expo.com. D23 Expo—The Ultimate Disney Fan Event—brings together all the worlds of Disney under one roof for three packed days of presentations, pavilions, experiences, concerts, sneak peeks, shopping, and more. The event provides fans with unprecedented access to Disney films, television, games, theme parks, and celebrities. For the latest D23 Expo 2017 news, visit D23expo.com. Presentations, talent, and schedule subject to change. To join the D23 Expo conversation, be sure to follow DisneyD23 on Twitter, Facebook, Pinterest, Instagram, and YouTube, and use the hashtag #D23Expo. Disney does cruising! The Disney Cruise Line has a fleet of 4 magnificent ships, the Wonder, Magic, Dream and Fantasy. Aboard each of these ships is a fun-filled, magical, experience just waiting for you and your family. Disney knows how to keep guests happy no matter if it’s on land or sea. Disney Cruise Line is a way to enjoy a luxurious vacation with the whole family. Aboard the 4 ships are areas for every age young and old. Nurseries for your little ones who aren’t potty-trained as well as a splash zone for those still in swim diapers, diapers swim or regular are strictly not allowed in any of the pools. Amazing kids clubs that make me wish I was a child myself, with fun age appropriate activities. Tween and Teen only clubs, which will keep your older children so happy you will want to know what they did with your real teenagers! And of course the elusive adult-only areas, (spa, pool, hot tub, bar, quiet areas, and adult only dining experiences) yes even though it is Disney there are areas where adults can be adults where no children can be seen or heard. Worried about keeping track of all the activities onboard or where your children/spouse may be? Don’t be, (2) Wave phones (think cruise cellphones) can be found in each room which allows you to stay in contact while onboard. Personal Navigator newsletters are delivered to your stateroom every evening so you can keep track of all the fun activities onboard and at the port of calls, as well as where and when characters will be meeting! There’s an app for that too, be sure to download the Disney Cruise Line Navigator App to keep you up to date on the happenings of the ship as well! Aboard the Disney ships you will participate in rotational dining so everyone has the opportunity to enjoy all the restaurants aboard the ships at dinner time. A part of rotational dining is keeping the same server each night, they will start to remember your drink orders and have them ready for you before you arrive if you are a habitual person like myself 😉 Not interested in participating in the main dining option? You are more than welcome to enjoy a quick service meal or the same food everyone else is enjoying in a less time constricted manner at one of the buffets aboard the ship. Dinner’s not the only time for amazing food experiences onboard, be sure to come back soon for an article all about dining with Disney Cruise Line, it really does deserve its own limelight! Even the chairs are part of the fun at Animator’s Palate restaurant! Disney may have an amazing fleet of ships, but they also have their own private island, Castaway Cay, which is definitely the cherry on top of this magical experience. Castaway Cay is an island about midway between the Bahamas and Florida. It is the perfect island experience, beautiful water, pristine beaches, and of course Disney magic! The island is set up much like the ship with areas for kids, teens, families, and adults only. Bonus Tip: For an extra magical souvenir for loved ones or yourself, Castaway Cay has a Post Office on site where you can mail a postcard or letter with the exclusive Castaway Cay postage mark. You will arrive home well before your letter does so this is a nice idea for when you are feeling “homesick” for the islands and want a pretty reminder to magically appear in the mail. The post office does only accept cash, so bring along some small bills when you disembark the ship! Mail a note from paradise at the Castaway Cay Post Office! Disney Cruise Lines is a magical vacation for the whole family, stay tuned for more exciting information about sailing the high seas with Disney! Kendra Trump is a busy mama who loves to travel! With countless trips to Disney Destinations under her belt she found her true passion for helping people experience the magic of travel as a consultant with Simple Luxuries Travel. 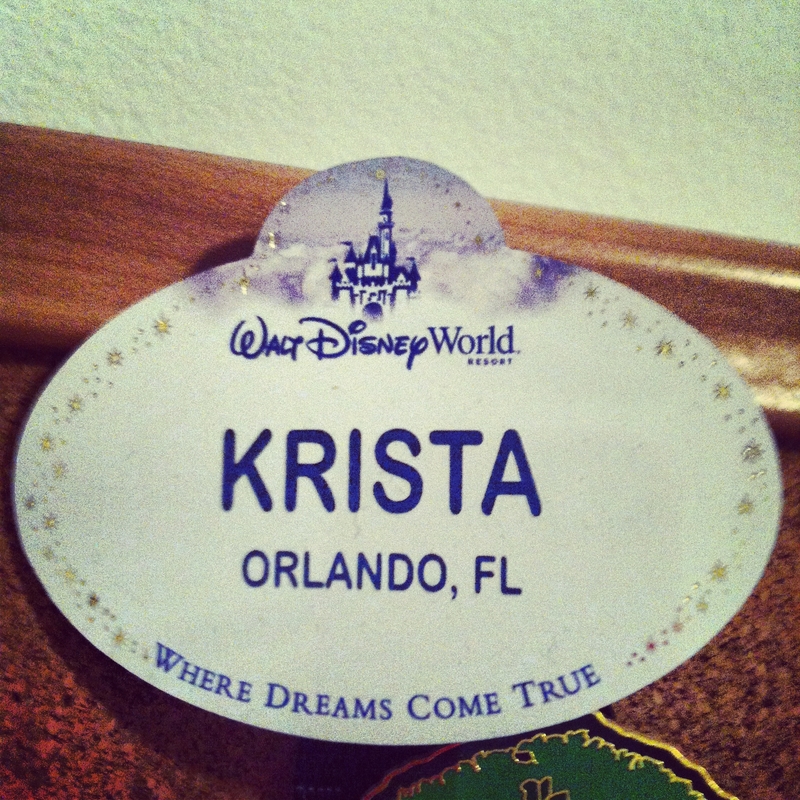 Kendra currently resides in Northern Virginia, with high hopes of moving to Castaway Cay one day soon! You can follow her blog from first kiss to rocking chairs for more travel fun. In October of 2015, Randy Crane invited me to be interviewed on Stories of the Magic Podcast. It was a true honor for me, and I got to go in depth about my history with Disney, my time as a cast member, and some other fun things that I have not shared any place else. Here are the links to these two episodes – and be sure to check out Randy each and every week over at Stories of the Magic on iTunes and Stitcher Radio. Stories of the Magic can also be found on Facebook, and Twitter. In addition to hosting this great show, Randy is a life coach and author! Check out his video at the bottom of this post for more information! Thank you Randy, for making me feel so special, and worthy of two whole episodes on your fantastic show. In this episode, we begin a 2-part interview with Krista Joy. Krista is a former Walt Disney World Cast Member, and a current blogger, podcaster, and lover of all things Disney, especially Walt Disney World. She is so genuinely excited and passionate about Disney that I know you’ll enjoy this. Her suggestion for a special dessert location for a celebration. In this episode, we conclude a 2-part interview with Krista Joy. Krista is a former Walt Disney World Cast Member, and a current blogger, podcaster, and lover of all things Disney, especially Walt Disney World. In part 1 we talked about what she did while working for Disney, whether working for Disney ruined the magic for her, why she started Disneyways.com, some insider tips on dining locations, and more! Her advice to you for following your dreams; and so much more!